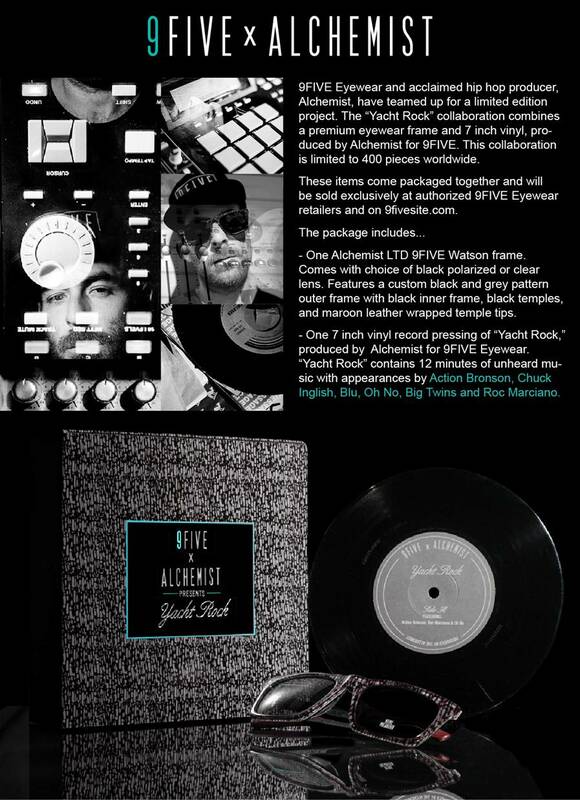 Los Angeles, CA - October 17, 2012 - 9FIVE Eyewear teams up with acclaimed Hip-Hop Producer Alchemist for a limited edition project. The “Yacht Rock” collaboration combines a premium eyewear frame and 7 inch vinyl, produced by Alchemist for 9FIVE. This collaboration is limited to 400 pieces worldwide. These items come packaged together and will be sold exclusively at authorized 9FIVE Eyewear retailers and on 9fivesite.com. - One Alchemist LTD 9FIVE Watson frame. Comes with choice of black polarized or clear lens. Features a custom black and grey pattern outer frame with black inner frame, black temples, and maroon leather wrapped temple tips. 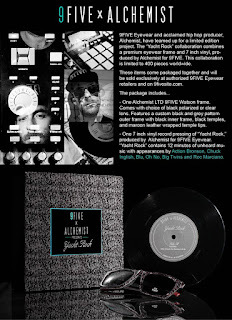 - One 7 inch vinyl record pressing of “Yacht Rock,” produced by Alchemist for 9FIVE Eyewear. “Yacht Rock” contains 12 minutes of unheard music with appearances by Action Bronson, Chuck Inglish, Blu, Oh No, Big Twins and Roc Marciano.